Seeking a respite from city life? Consider planning your next island getaway at Bintan, an idyllic Indonesian island with lush greenery, beautiful beaches, and charming resorts that will satisfy your every holiday whim. Depending on travel needs and preferences, travelers can enjoy a good variety of recreational activities and attractions, ranging from the adventurous to the cultural-centric. The adventurous can embark on ATV rides. Bintan, an island about 2.5 times the size of Singapore in terms of land space, is inhabited by only approximately 300,000 people. Most of the island is occupied by lush forests, rolling hills, and pristine beaches, giving visitors plenty of opportunities to get up close and personal with nature. The Mangrove Discovery Tour in Bintan Resorts is a unique back-to-nature experience, which allows one to explore the wonders of the island’s mangrove forests. Join the day tour for an educational ride to learn about the different species of mangrove trees and observe the surrounding flora and fauna. For an unforgettable experience, embark on the night tour and let glowing fireflies and the sparkling blanket of stars lead the way. Get closer to Mother Nature and explore more activities: 7 Reasons Why Bintan Is a Hot Spot for Nature Lovers. Panglong Village is inhabited by the orang laut (sea gypsies). During the era of the spice route, Bintan was an important trading post for Malaysian, Chinese, Buginese, Arabian, and European merchants. The cultural exchange that took place among migrants is reflected in the diversity we see today around the island, be it languages, architecture, religions, or physical attributes. To understand Bintan is to understand such diversity. On the northeast peninsula, Panglong Village is inhabited by the orang laut (sea gypsies), a native tribe that once led a nomadic life. Despite moving back to land, the villagers’ way of life still largely revolves around the sea. Situated further down the eastern coastline lies Grotto Santa Maria, a site that features a trail of the ‘14 Stations of the Cross’ carved in limestone, leading up to a chapel and the stature of Santa Maria well-preserved in a cave. Meanwhile, a short pompong (water taxi) ride away from the city center of Tanjung Pinang lies Pulau Penyengat, an offshore island that holds great historical significance to the last phase of the Malay Kingdom. Built using egg whites as the bonding agent, Masjid Raya Sultan Riau (Sultan of Riau’s Grand Mosque) sits majestically here. 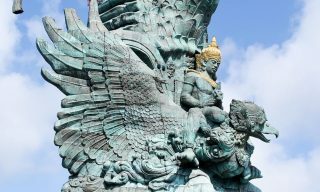 There are also two prominent temples in Tanjung Pinang: Vihara Ksitigarbha Bodhisattva that is famous for its 500 life-sized lohan statues and Vihara Avalokitesvara Graha, which boasts one of the tallest Goddess of Mercy statues in Southeast Asia. Continue the ride to Senggarang Village, which is known to be the first ethnic Chinese settlement on the island containing interesting religious sites, such as the centuries-old Banyan Tree Temple. A few foreign languages and dialect are spoken in Bintan: Malay, Mandarin, Teochew, and, as the tourism grows, English and Singlish (short for Singaporean English). However, it is important to note that Bintan has a special place in the formation of Bahasa Indonesia, as it is the nation’s official language. It was Raja Ali Haji, an esteemed poet with roots from the island, who laid the foundation of the language in the first monolingual Malay dictionary. The cultural diversity of the island is mirrored in its culinary variety. The cultural diversity of the island is mirrored in its culinary variety. Popular dishes such as carrot cake (pan-fried radish cake), fried noodles, and kuey teow (flat rice noodle) were heavily influenced by the Chinese. On the other hand, padang restaurants provide a wide array of halal comfort food for the majority Muslim population. A padang restaurant is the best place to enjoy rendang, the iconic West Sumatran delicacy that once topped the World’s 50 Most Delicious Foods list by CNN. 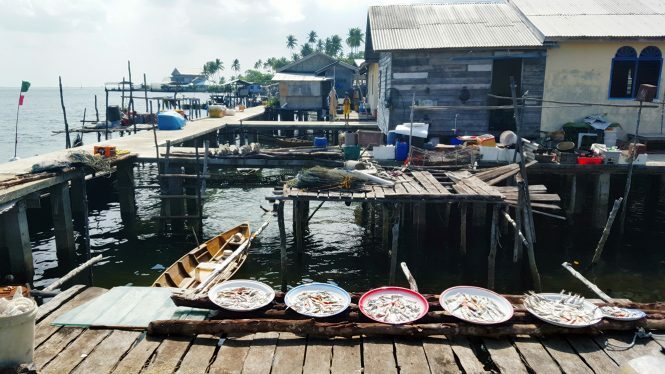 Bintan, an island dotted by fishermen villages and bordered by 105 kilometers of coastline, is also big on seafood. 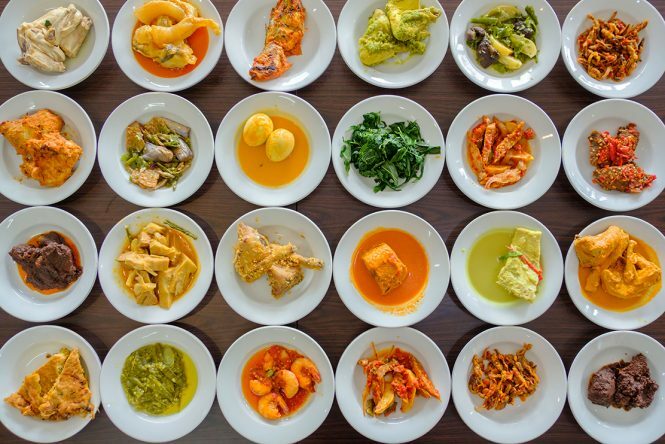 The options are endless, ranging from black pepper crabs to garlic butter shrimps to the iconic gonggong (sea snails) and sup ikan (fish soup). Whether you’re dining at established restaurants such as The Kelong Seafood Restaurant of Nirwana Gardens or local food places like Akau Potong Lembu and Rimba Jaya Night Market in Tanjung Pinang, fresh seafood is abundant. The island has a fair share of modern cuisine too. 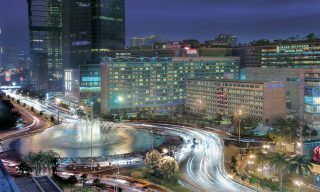 Here, travelers will find cafes and restaurants that showcase sophisticated cooking techniques, delicious international dishes, as well as specialty cocktails and mocktails. Alternatively, head to the in-house restaurants of Bintan Resorts for a wide array of cuisines to satisfy your taste buds. Embark on a food tour: Here’s Where You Can Find Bintan’s Best Eats. Test out your balance with stand-up paddling and feel the wind in your hair on a jet-ski ride. Water activities are aplenty on the island and there’s something for everyone. Test out your balance with stand-up paddling, feel the wind in your hair on a jet-ski ride or simply enjoy a leisure swim. With clear blue waters and rich marine life, the White Sands Island is a great place for snorkeling and scuba diving. 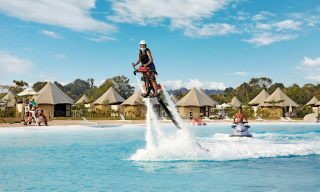 The largest recreational man-made seawater lagoon in all of Southeast Asia, the 6.3-hectare Crystal Lagoon of Treasure Bay Bintan, also offers a diverse range of water sports such as cable-ski, wake board, and the Jetovator (flying water bike). 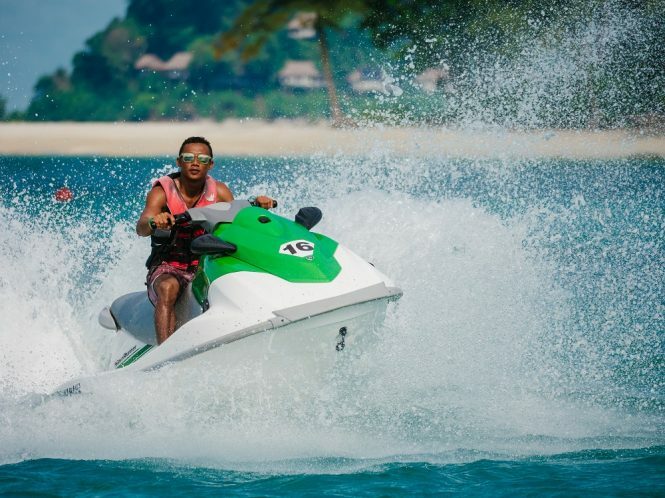 There are also no shortage of land activities in Bintan Resorts. Get your adrenaline pumping with an ATV ride as you conquer the rugged terrain or opt for a cruise on the two-wheeler personal transportation. With four championship golf courses, Bintan Resorts has long established itself as a premium golf destination in Indonesia. 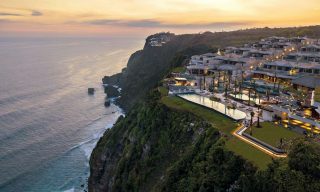 The spectacular sea views and dense verdure provide as a stunning backdrop to golfers as they make their winning swings. 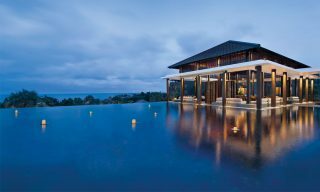 After all the action, treat yourself to a rejuvenating spa session at award-winning Banyan Tree Bintan spa or participate in a yoga session at Club Med Bintan Island. There’s plenty to experience in terms of accommodation. Whether you’re a honeymooner or traveling with family and friends, there’s plenty to experience in terms of accommodation. Planning a relaxing and romantic getaway? 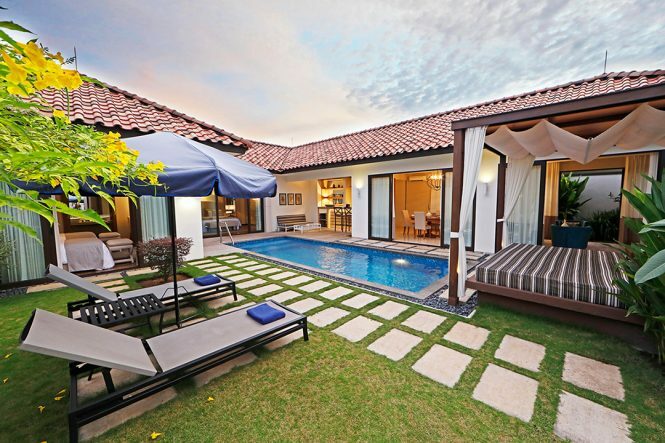 Book a stay at a villa-only resort such as Banyan Tree Bintan or Holiday Villa Pantai Indah and chill out in your own private pool. Families with young children will enjoy the likes of Club Med Bintan Island and Nirwana Gardens, which are known to have activities catering to all age groups. The young and adventurous will fancy the glamping (glamorous camping) tents of The Canopi Resort or the design-conscious rooms of the newly opened Cassia Bintan. Whether it’s your first or umpteenth visit to Bintan island, there’s plenty to discover each time.